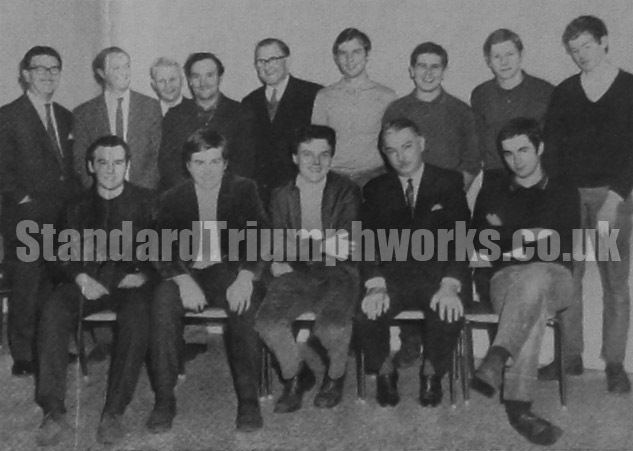 Apprentice tinsmiths 1968, Mr Swindle can be seen front row 4th left – can you help recognise anyone else? The awards are based on the annual examination and class work results of the apprentices. Included in the assessment of the results are marks for practical work, conduct, punctuality, neatness, and condition of drawing instruments. The awards were subscribed to by the Company and the Shop Stewards’ Committee. They consisted of money with which the students could buy tools, books, etc., of their own choice. 1st Prize senior, Mike Egginton. 1st Prize junior, David Yeomans. Mr Swindle examined some of the work and thanked all the personnel concerned for training our apprentice tinsmiths to such high standards. UPDATE: “Mike Egginton is pictured front row centre (third from left).” Thanks to Martin Murphy for the info. “My cousin Jim Trevelyan is the third person from the right on the back row.” Martin Cox “His father Jim Trevelyan senior worked as welder in the tinsmiths shop and was my uncle. Jim Trevelyan is able to add some further names to the photo. Left to right on the back row: John Carroll, Bob Rowe, Eddie Bishop, Eddie Parry, Joe Cappleman, Dave Hawtin, Jim Trevelyan and unknown. Front row Left to right: unknown, Bill Byers, Mike Eddington, Cliff Swindle and Dave Arkle.